These Custom Plastic Bags feature comfy, soft loop carry handles. This makes them perfect for trade shows and other events where people carry the bag for a couple hours or more. Each Custom Plastic Bag features single wall 3mm thick plastic, a 4" wide bottom, and flexible, soft strap handles. Single or double side imprinting of your design is available. You can choose from either white Trade Show Bags or Full-Color Trade Show Bags (10,000 piece minimum for full-color custom bags). 11X15+4L1 11"x 15" + 4" Soft Loop Handle Bag 0.65 0.53 0.45 0.41 9½" 11½"
16X14+4L1 16"x 14" + 4" Soft Loop Handle Bag 0.77 0.63 0.55 0.50 14½" 10½"
15X18+4L1 15"x 18" + 4" Soft Loop Handle Bag 0.83 0.67 0.60 0.54 13½" 14½"
18X18+4L1 18"x 18" + 4" Soft Loop Handle Bag 0.96 0.77 0.69 0.62 16½" 14½"
20X20+4L1 20quot;x 20" + 4" Soft Loop Handle Bag 1.06 0.85 0.75 0.67 18½" 16"
It's easy to get started with you Custom Soft Loop Handle Bags. Simply contact us at 1-800-233-0828 and submit your camera-ready artwork to graphics@kardwell.com (you can also mail your art). You will receive your Printed Plastic Bags in about 3 weeks. Rush delivery is available. 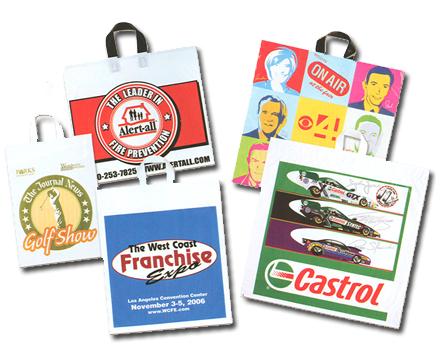 For more information on our Custom Printed Trade Show Bags with extra-comfortable carry handles, please contact us at 1-800-233-0828.